Indianapolis, Indiana, 1975: a crowd of about 300,000 fans stand at the Indianapolis Motor Speedway, heads and hearts pointed toward the giant American flag in the distance. Purdue University’s band performs the national anthem, and Jim Nabors sings “(Back Home Again in) Indiana” for the fourth consecutive year. With the crowd riled and engines fired up, it’s time to commence the 59th running of the Indy 500. James Garner, no doubt taking a break from filming “The Rockford Files,” drives the Buick Century Custom V-8 pace car, leading the cars through their first lap. A.J. Foyt, Gordon Johncock and Bobby Unser are behind Garner. At the green flag, Foyt carried pole position and the early lead, with Johncock and Unser rounding out the first three to pass the bricks. Throughout the race, several drivers managed to take the lead briefly, with Wally Dallenbach holding first for a full 96 laps, beginning at lap 59. The race was cut short because a huge downpour threatened driver safety and caused officials to end the race at lap 174, a full 26 laps early. With Unser in the lead when the red flag waved, he was declared the winner, with Johnny Rutherford and Foyt taking second and third, respectively. There was another winner that day: John Wayne Leary, known as just Wayne to most, was Unser’s chief mechanic under the All American Racers crew that managed the Eagle 74 car, and as such was responsible not only for the drivetrain, but just about everything else related to the performance of Unser’s Offy-powered ground missile. In fact, an old bar in Indianapolis purportedly displays a quote of Unser’s: “Wayne Leary can fix anything.” And it was true. 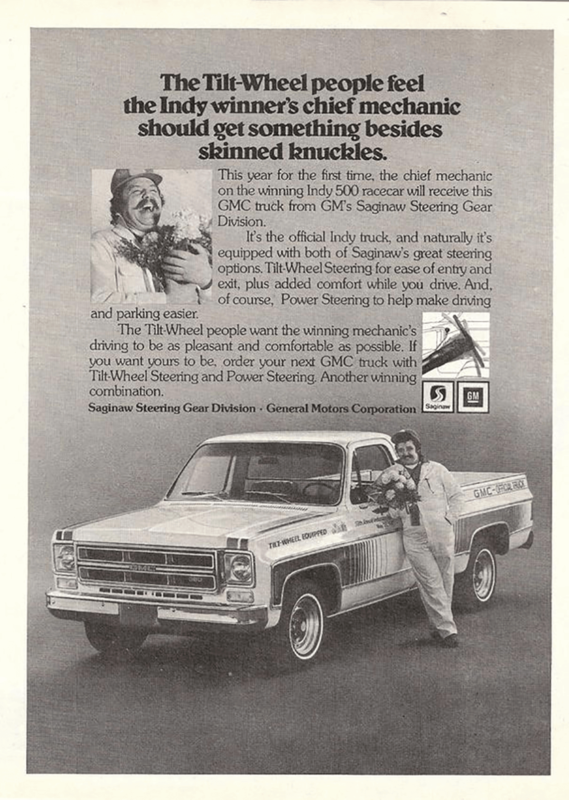 As the winning driver’s chief mechanic, Wayne won a much-publicized award, a new GMC truck courtesy of General Motors’ Saginaw steering division, which had been making a lot of advancements in the mid-’70s. 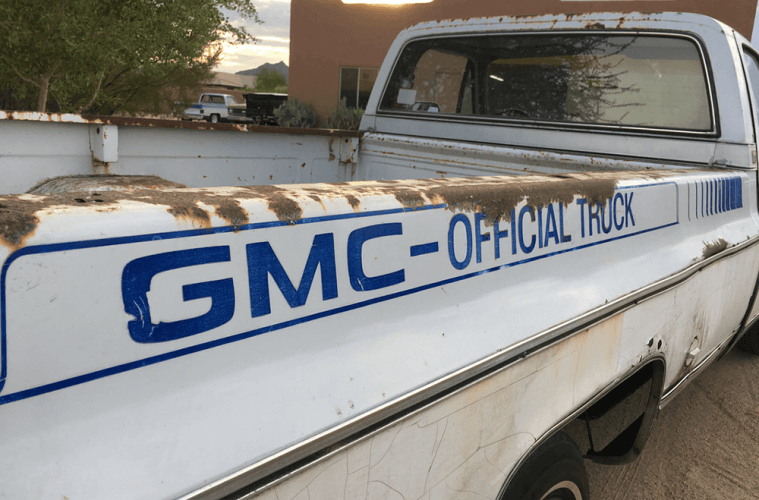 Although it has been reported that GMC planned to build 500 replicas to be sold to the general public, it is thought that Leary’s truck, plus one or two others, were the only ones actually built. 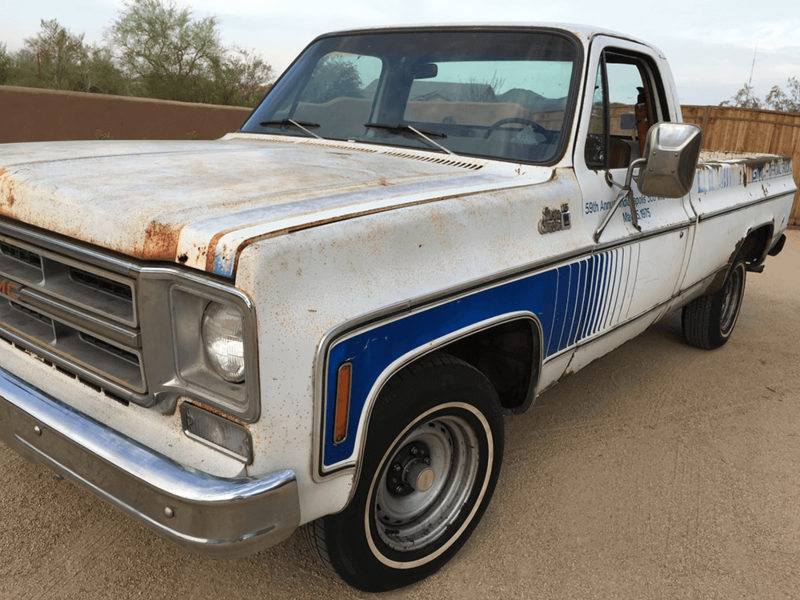 Joe’s ’75 GMC Sierra Grande Indy 500 hauler was a rare find, and up until recently it was thought to be the only one in this configuration still in existence. 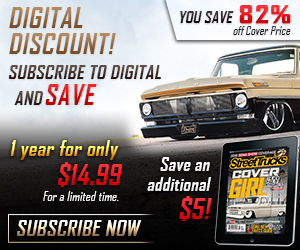 In fact, the truck shown on these pages was, until recently, thought to be the only one to survive, and was on the field at Indy as a support truck. However, as Yoda once said to Luke Skywalker, “There is another.” But, we’ll get to that part later in the story. 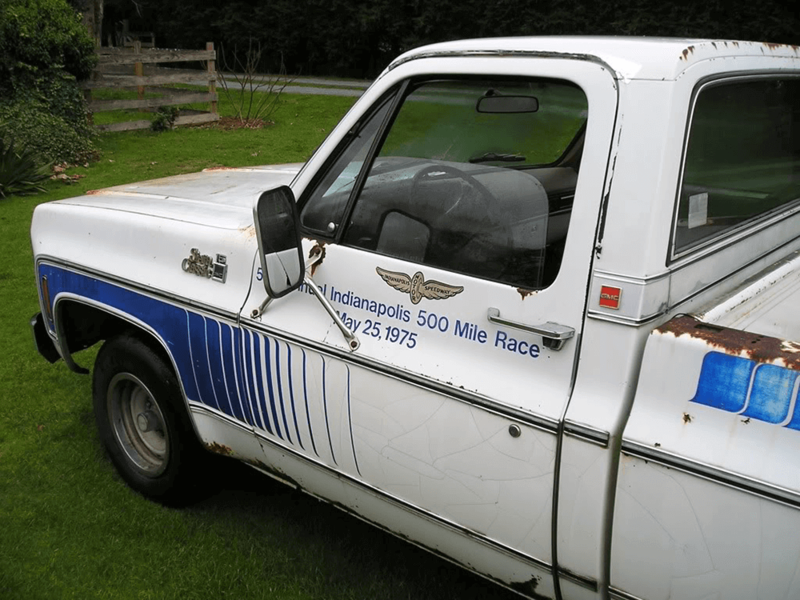 As the tale goes, this truck was purchased at the 1975 Indy 500 on race day by David’s grandfather, Al Rosen, and then delivered to Washington state. 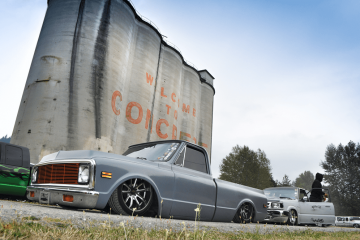 After his passing in 1979, a family friend, Terry Ion, bought the truck. 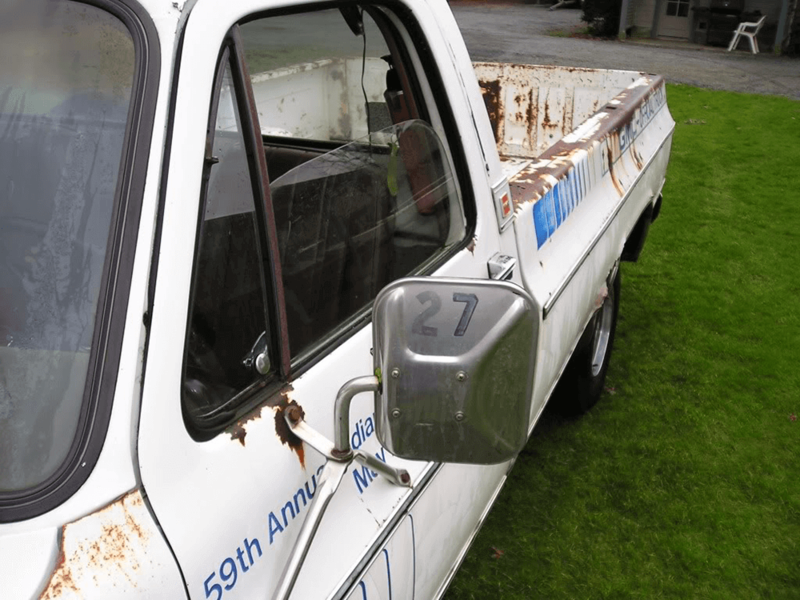 Despite being rare, the truck was driven somewhat regularly for about 10 years, but was eventually parked near a blackberry patch, where it sat for more than 30 years. The truck ended up back in the family when Al’s grandson, Mark Dickhaut, acquired the truck from Terry and dug it out of the berry patch. 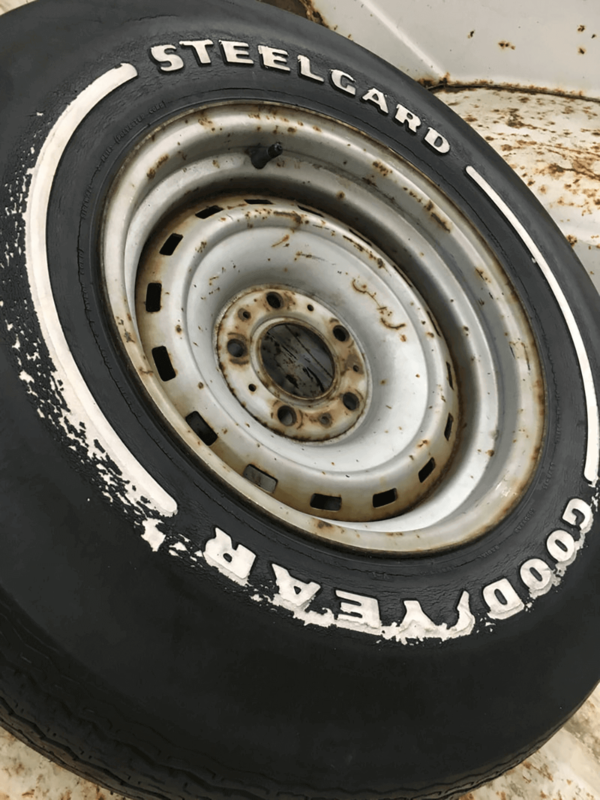 Although the original graphics on Joe’s Indy truck have seen better days, there is enough left to be able to faithfully restore the truck to its 1975 condition. 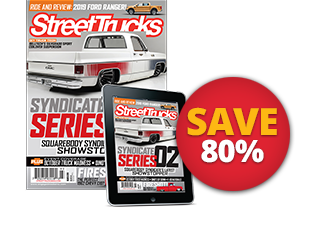 Our buddy, Joe Yezzi of Squarebody Syndicate, recently took over stewardship of the ’75 Indy 500 hauler when Mark’s son, David Dickhaut, decided to finally give the truck a second chance. 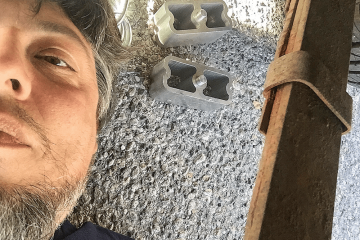 David had good intentions, as many of us do, but realized that the truck would continue to rot away without proper time and funds to tackle a project of this magnitude. Joe was able to finally convince David to sell it, and here we are. 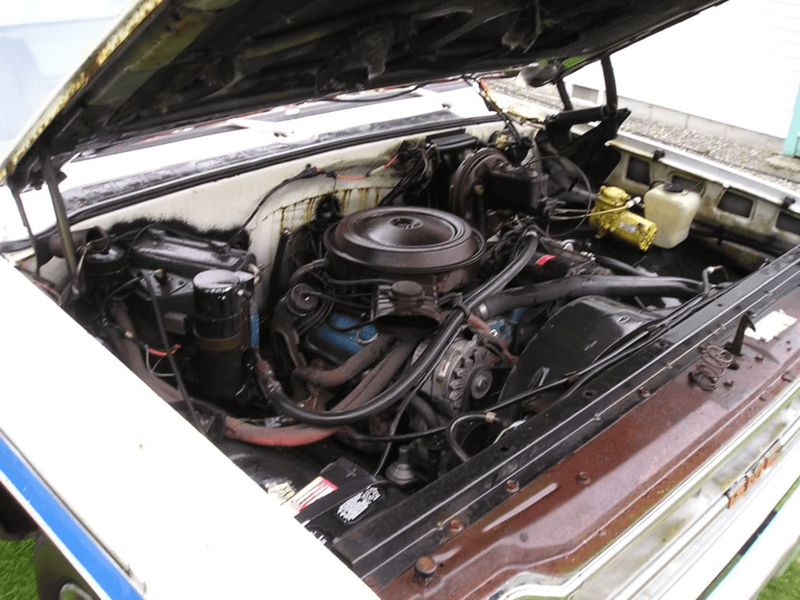 Now that it’s in Joe’s hands, the truck will be completely restored to its glory days. 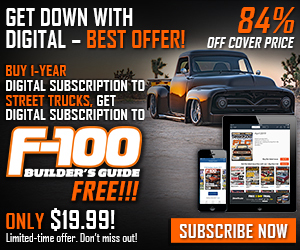 With Joe’s connections in the square-body world, this restoration will come easier to him than to most, but we’re sure there will still be challenges ahead. We were, of course, wondering how in the world Joe could resist just slamming this thing with big wheels despite (or perhaps because of) its heritage, but he let us in on a little secret: He’s also building a replica, but one that will feature a full Roadster Shop chassis and all of the latest goodies. 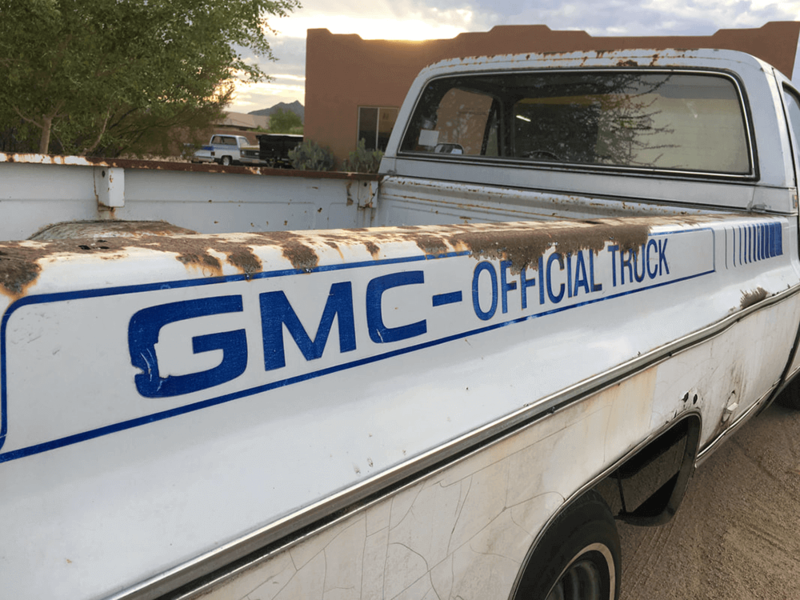 So, he’ll have the best of both worlds: a fully restored, uber-rare ’75 GMC Indy hauler, and an evil twin that could probably handle its own at Indy Raceway. The importance of the number 27 on the mirror is a bit of a mystery, but leads us to believe it might have been the last truck built for the race. 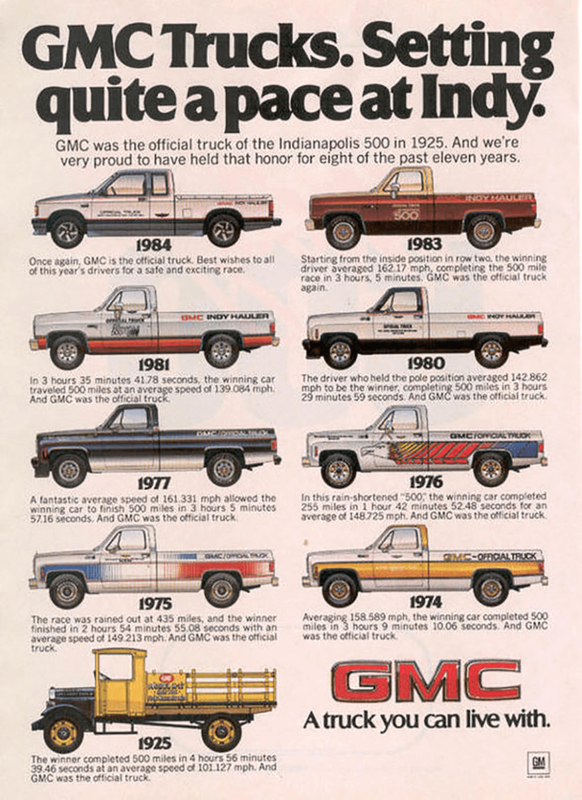 GMC built 26 various trucks and vans for the race. We assume that #1 was not included in the list since it was the giveaway truck and would not have served trackside duty. Only Joe’s #27 truck and the giveaway truck are thought to have been made in this particular configuration. 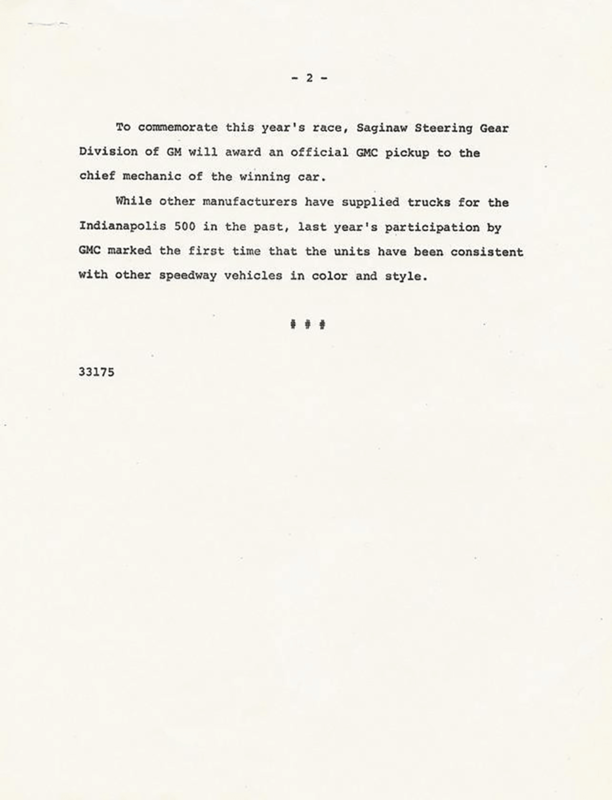 As for that part about another ’75 Indy 500 hauler still being out there, just as I was ready to wrap up this story, I came across some interesting information while researching ’75 Indy 500 trucks. I had to dig extra deep. If my information is correct, there is a second truck in existence, and it’s the one that was awarded to Bobby Unser’s crew chief, Wayne Leary. Thanks to sprint car racer and Indy race team member Roy Caruthers, I’ve learned that not only has the giveaway truck survived, but it has remained in Wayne’s family, and is currently owned by Wayne’s nephew. We were hoping to get more information before going to press, but it seems as though we’ve run out of time. This nephew is also a racer and race crew member, so we think it’s safe to say that he won’t be inclined to let the truck go—at least not to just anyone. 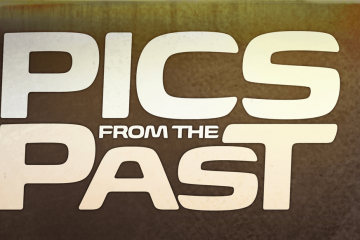 We hope to bring you more information if and when we get a solid lead, but for now we hope you enjoy this brief history of Joe’s latest come-up. 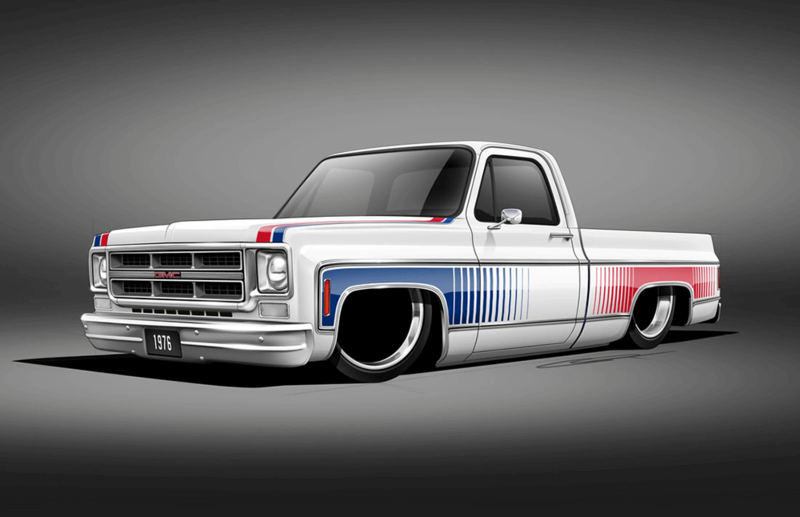 Monroe was a big sponsor of the Indy 500, and made sure to get its product on GMC’s support trucks. The original Max-Air air shock setup still works as it should. 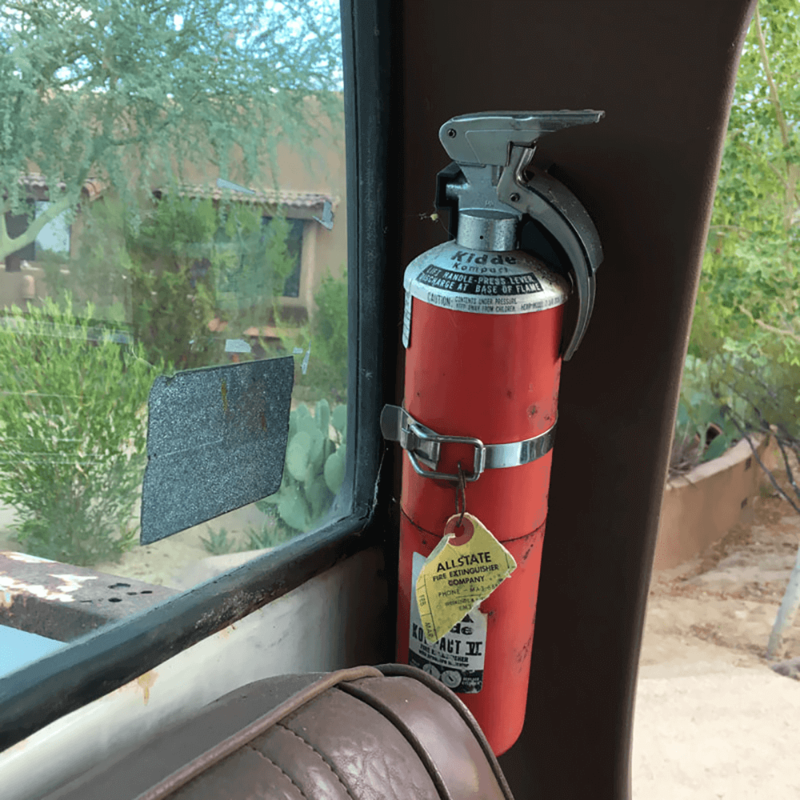 As an Indy 500 support truck, the GMC was fitted with a fire extinguisher, which is still in place more than 42 years later. 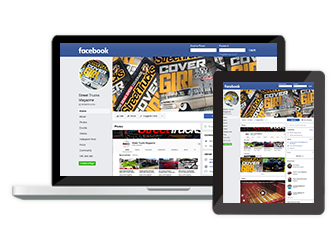 The spare wheel still wears its original Goodyear SteelGard tires, which were a variation of the tires equipped on Corvettes. Although SteelGard reproductions are available, this particular design with partial whitewalls might be a tough find. 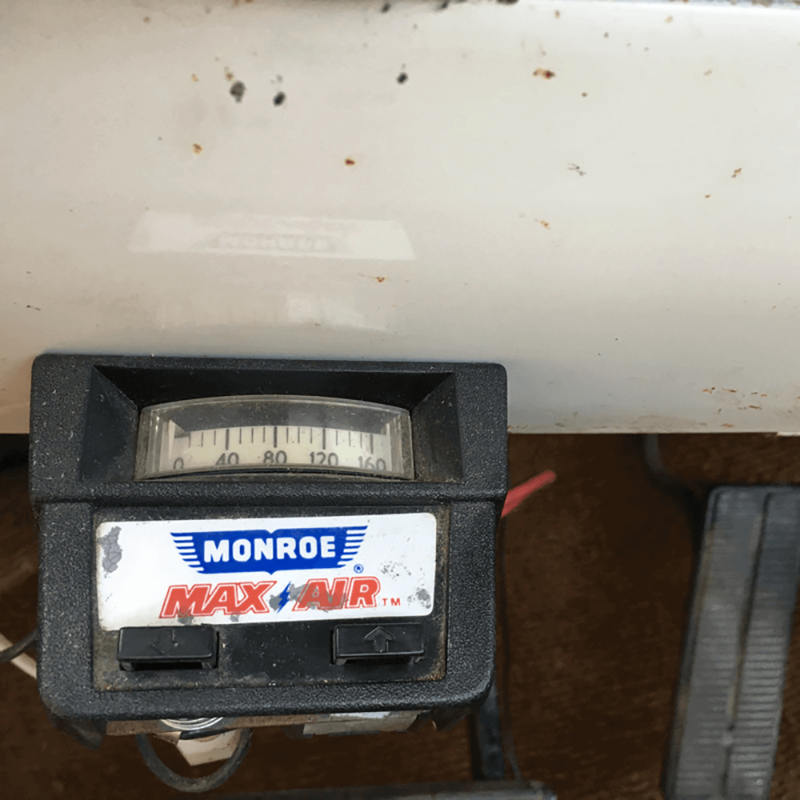 The 350 engine is still a runner, but we’re even more impressed that the original Monroe air shock compressor is still intact. 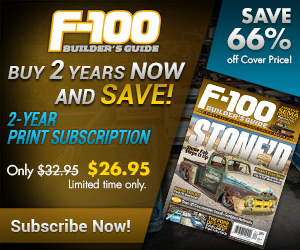 Joe’s Indy hauler clone will look a lot like its restored cousin, but it will definitely be unique. 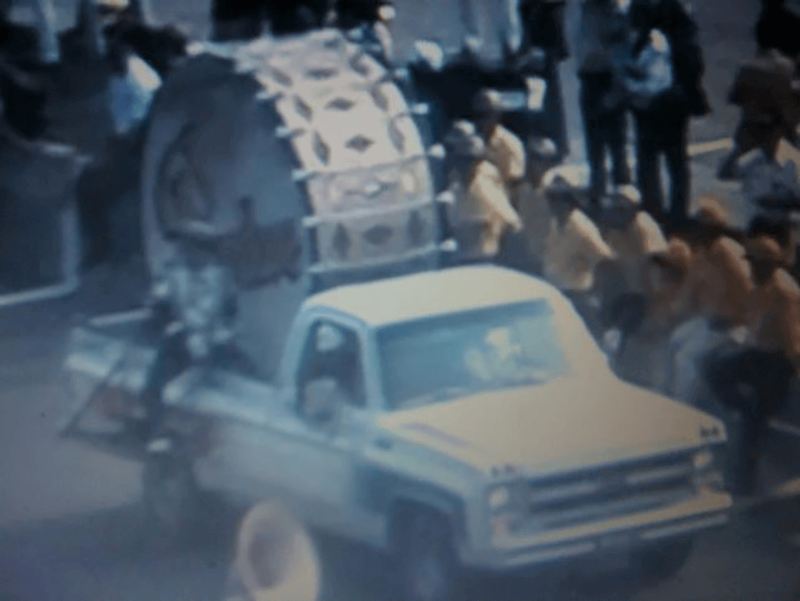 Joe’s truck on race day at the 1975 Indy 500 carrying the Purdue University marching band’s “Big Bass Drum” during the parade lap. 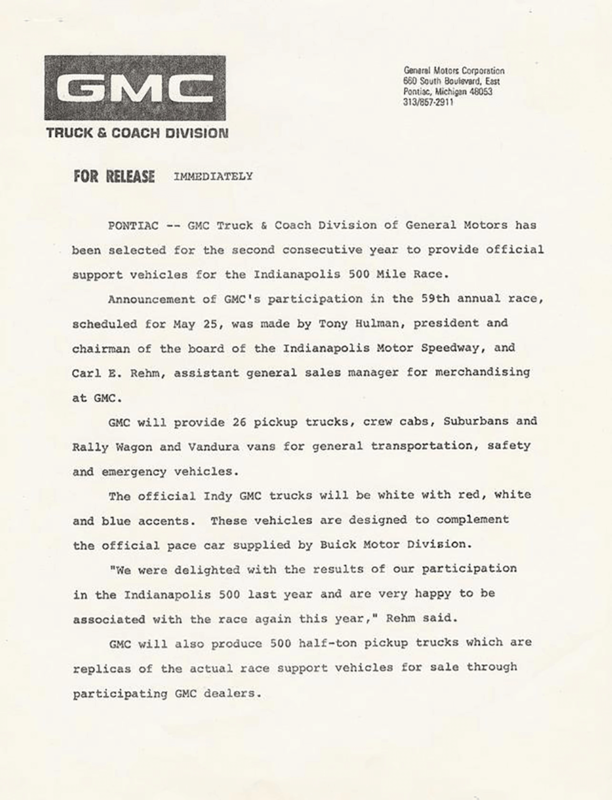 Here is the original press release announcing GMC’s involvement with the 1975 Indy 500 race. 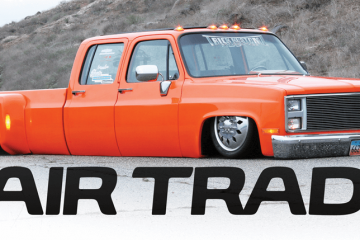 Previous ArticleThe Classic Auto Show Returns to L.A.